Professional philanthropy has been my career’s work: first as a frontline fundraiser and now as an educator. My daily work at The Fund Raising School allows me to interact and learn from a great diversity of nonprofit organizations. We see individuals from start-ups and very small, grassroots nonprofits as well as the large, legacy institutions in our classrooms. Part of my role here is to translate the bounty of research produced at the Lilly Family School of Philanthropy for our practitioner audience. I couldn’t do that part of my job without having one foot in practice. About the same time I began my role at The Fund Raising School, my family and I moved to Johnson County, Indiana. While I was thrilled about moving home to Indiana after a stint in New England, I was less sure about moving south of Indianapolis. I had no personal or professional network there. But the house was purchased and I had no choice but to embrace Johnson County as my new home. I set out to create a network and quickly found myself in the office of the Johnson County Community Foundation. What a fortuitous meeting. At that initial meeting with the foundation’s VP for Development, Kim Minton, we hatched an idea for a Giving Day in the county. About two years later, that giving day became a reality. Over those two years, I worked closely with Kim and the board’s development committee, creating a strategy for the day. From offering a sounding board to writing talking points—all while sharing my enthusiasm for this community—I provided additional perspective on how to make the day successful. It was such a joy on June 21 to watch the dollars come in. We often say we’re “in the joy delivery business” and I felt that in abundance on giving day – through my own gifts of money and time, but also in seeing that joy in the face of others. Like many volunteers, I do so for many reasons: to improve a place that I love, to use my skills, to gain new ones, and because it’s joyful. Plus, it gives me good stories to share in class that bring our principles and techniques of fundraising to life. I’ve been working part-time at the Lilly Family School of Philanthropy for a year, mostly managing and writing for the school’s blog. In addition to my hours at the school and beginning the graduate certificate in January, I served as a substitute teacher during the academic year. However, I wanted to find a position this summer where I could grow my skills and learn more about the philanthropic sector. With help from Sarah Nathan, I applied for an internship with the Johnson County Community Foundation (JCCF) located in Franklin, Indiana, about 25 minutes south of Indianapolis. Community foundations are interesting and frankly, incredible engines. Indiana is unique because we have a community foundation in every county. These foundations were established by a Lilly Endowment initiative to serve their local communities. No matter how small in population the county is, each and every one has a community foundation. Originated in 1991, the Johnson County Community Foundation is located in a beautifully restored turn of the century mansion. JCCF has five full-time staff members and it’s been compelling to see the amount of work completed by those five. The organization hosts over 300 endowment funds, which are entities set up by individuals or corporations designed to support a local agency, scholarship program, or issue area. Every year, JCCF gives out grants to local nonprofit organizations and scholarships from its funds to graduating high school seniors and current college students. The foundation also undertakes its own programming to support its operations, other community organizations, and county-wide initiatives. Every year, it hosts events like Give Back Gals, a women’s golf challenge, Color the County, which adds community-painted public art throughout the county, and Monte Carlo, a popular fundraising event. This year, JCCF hosted its first-ever Giving Day, a 24-hour event supporting seven Johnson County nonprofits. JCCF provided $70,000 to help start endowments for seven participating nonprofits, while the nonprofits raised money to support current operations and their endowments. After a day of fun events, lots of food, and community building, the event raised over $205,000 in total to help support these nonprofits in the short and long term. It was an incredible outpouring of support for these nonprofits, the foundation, and the community as a whole. It’s been quite a summer. 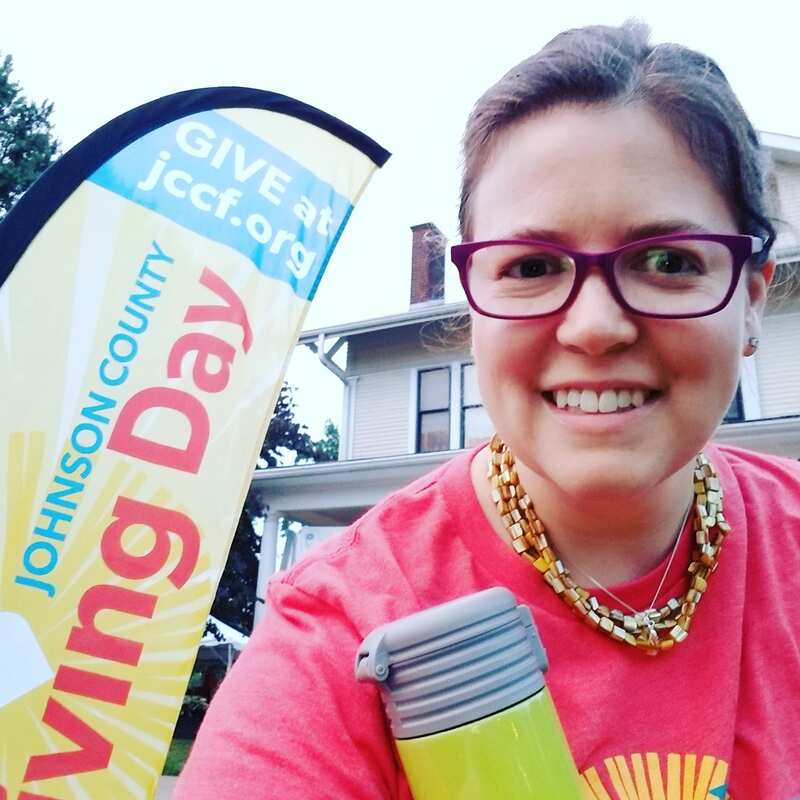 I’ve learned and increased practical skills at the foundation – how to help build a social media campaign for both JCCF and the Giving Day nonprofits. How to use the database here to input information about donors, build profiles, and write acknowledgements. How to research best practices (thanks to The Fund Raising School!) in building annual sustainability. How to evaluate an event and build an effective survey to capture qualitative and quantitative data. How a nonprofit’s growing awareness of best practices in social media can raise its connections to its supporters and others. How to use knowledge gained from the courses at the Lilly Family School of Philanthropy to analyze how this one foundation/nonprofit utilizes its knowledge to help the community. And there’s the intangible learning as well. How much work and effort goes into planning, executing, and then evaluating a large event, especially one that’s never been done before! How five staff members can power an involved, active, and influential foundation that focuses on what makes a community great and leverages that knowledge to create an even better one. How important it is to use the knowledge you’ve learned and implement it into a cause that you care about. So it’s been quite a summer for me. I consider it having the best of both worlds – one foot in learning and writing about philanthropy, and one foot putting that knowledge into practice in the setting of a foundation. I’m thankful for my experiences, and I know that this summer of learning will only help me as a flowering philanthropist.